How can one antenna do FM, VHF, and UHF? Actually what you see above you isn’t one antenna. While our HD8200XL antenna is capable of receiving FM, VHF, and UHF, it’s a mistake to call it just one antenna. It’s a whole antenna system, and therein lies the magic. Antenna reception works pretty simply if you think about it. Each broadcast frequency corresponds to a wave of a different length. Wavelength and frequency are actually just two different ways to describe the same property of a signal. Now, when you have an antenna, it’s going to do its absolute best if it’s an even fraction of the wavelength, for example one-half, one-quarter, that sort of thing. Here’s an example: According to this page, a broadcast signal at 550MHz (which is UHF channel 27) is 21.4″ in wavelength. From the top of each wave to the next is about two feet. So ideally to pull in that signal you would want an antenna 21.4″ wide, or 11.2″ wide, or 5.6″ wide, some number that evenly divides 21.4. While it would be nice to have 60 separate antennas, one for each channel, it just doesn’t work that way. I mean, most likely your spouse wouldn’t go for it, and it would be a pain to maintain. So you use something like the antenna above. 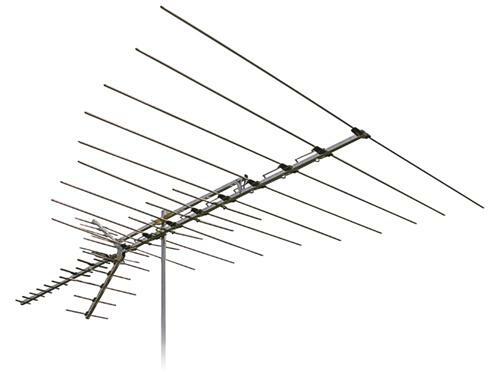 It actually has 69 different antenna elements built into it, which not only cover the VHF and UHF channels used today but also the channels that have been used in the past as well as FM frequencies. All these antennas are stacked together so they don’t interfere with each other and the signals are combined into one cable. Another way to have one antenna work really well for multiple frequencies is to change its size. When you use a telescoping antenna on a portable radio or TV, that’s what you’re doing. You can make the antenna bigger or smaller, and by moving it, you’re changing the “apparent size” because you’re changing the part that faces the tower straight on. Finally, there’s a bit more to consider. As frequencies go up, wavelengths go down. A VHF signal has much bigger waves than a UHF one, and when you get to the frequencies that satellites use, those waves are pretty tiny. As you deal with these ever-shrinking waves, you don’t have to be as picky in trying to match the length of the antenna to the length of the wave. This is why a VHF antenna usually needs multiple elements, a UHF one can sometimes make do with just a loop, and a satellite antenna is just basically a small square.